"Nick is about to head overseas on an adventure of a lifetime. It’s what he has always wanted, to travel the world, to experience new cultures, see the places he’s dreamed of for so long. He should be over the moon. Instead, he’s been in a slump ever since he lost his friend Em. 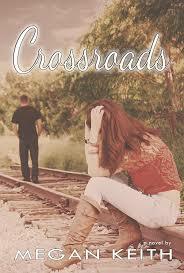 Nick has reached a crossroads in his life - the girl or the dream. Seems like an easy choice when the girl of his dreams is Emma. But what if she doesn’t see things the same way?" My heart starts to race at the sound of his voice over the loud speaker. Immediately I seek out the location of the booth and spot him as he walks out of it. He looks good. I can’t believe he’s here. I know my eyes are bugging out of my head but I can’t stop staring. Not only is Nick the DJ tonight but there he is, in my direct line of sight with his arms around a girl. And she’s very attractively smiling up at him. I swipe at my eyes as angry tears form in them. She’s right, we had both checked. There must have been a cancellation or something, it’s the only explanation. I stand still as a statue as I watch Nick put his arm around the girl’s shoulder and they head for the exit. When I can no longer see Nick, I turn to face her. The look on her face is a mixture of pity and pleading. “Who’s for another drink?” I ask with false cheer. I don’t wait for a reply from either of the girls as I hastily make my way to the bar. I shove my way to the front, not caring about the toes I’m stepping on or the rudeness of my approach. I don’t care that I am cutting in line. I yell out my order for a shot of tequila. Before I’ve even paid, I have drunk it and ordered another. Kat spins me back to face her. I turn away from her. I feel the hot tears about to overflow from my eyes as I hand over my money to the bartender and swallow my second shot. I look Kat square in the eyes. Like an unseen force Megan Keith has managed to capture audiences all around the world with once again another brilliant work following the first installment of "Finding My Way". In the riveting storyline of "Crossroads" I must say that I am, if not, more in love with the characters than I was in "Finding My Way". Torn between heartbreak and love, Emma and Nick take a long journey to discover if their relationship can withstand the many tests life throws at them. 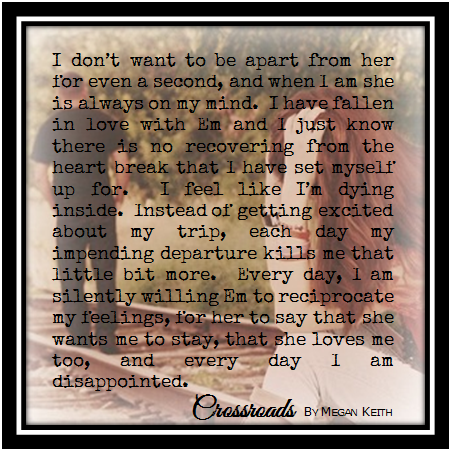 Overall a very fantastic read that will leave you undoubtedly happy while enjoying the roller coaster ride Emma and Nick endure through discovering their relationship!